A photo of the man's hand caused a lot of outrage after it went viral on social media. Srinagar: Usually, when one enters a club, their hand is stamped by the bouncer outside. But it’s not every day that one needs such a stamp from a magistrate to cross a road close to his home. On Wednesday, in order to cross the highway in south Kashmir’s Anantnag district, a civilian approached the magistrate for approval. The officer on duty, an executive magistrate, stamped and signed the man’s hand allowing him to use the road in Sangam. A photo of the man’s right hand, which had a stamp, signature and the date on it, along with a handwritten noted saying “allowed to Sangam”, soon went viral on social media. 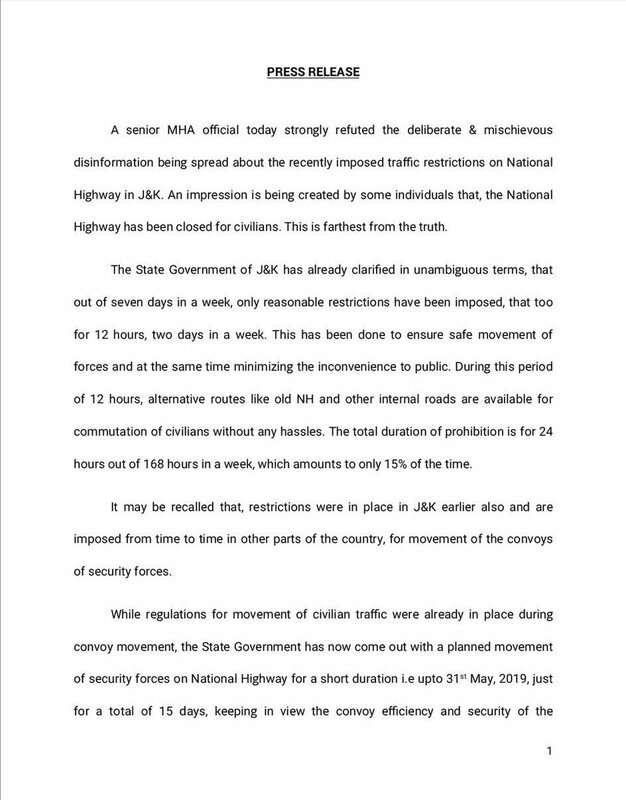 The incident took place on the second day of the two-day-a-week ban on civilian movement on the highway ordered by the government on April 3 Every Wednesday and Sunday between April 7 and May 31, the 300-km-long highway is to be kept reserved for convoys of security forces. Ghulam Mohuidddin, a Naib Tehsildar (deputy executive magistrate), who is one among the 25 such officers deputed on the highway to “regulate” traffic on ban days in Anantnag, said he had to do it as he had “run out of passes”. “The person who was a local and had to cross the road. Nothing else. There was a huge rush and I was out of passes. So I stamped his hand,” Ghulam told The Wire. It wasn’t possible to trace the civilian or the person who had first uploaded the photograph as it was shared hundreds of times on social media. But many condemned the highway ban, calling it inhumane a denial of the constitutional right to movement. “This is how permission is granted to people in J&K to use their highway. Their hands are being stamped & written on. I don’t know what to say! Should we be flippant & mock the attempt at saving paper? I’m just angry at the degrading, inhuman treatment being meted out to people,” tweeted former J&K chief minister Omar Abdullah. Permission to travel on Srinagar National Highway! Complete denial of the Constitutional right to movement. “A civilian granted permission to drive from home to office on the Kashmir highway. The highway magistrate stamp is only valid till next hand wash! It reminds me of a movie from Hitler’s era,” wrote journalist Peerzada Ashiq. “There was a time when employment orders were issued on a pack of cigarettes and there is a time when Highway pass is issued in this way….#KashmirTragedy. Hope the stamp is not washed away before reaching the destination,” read a post by one Facebook user. Facing huge criticism over the ban, ministry of home affairs (MHA) on Wednesday released a statement justifying the “reasonable restrictions”. The press note released by the home ministry. 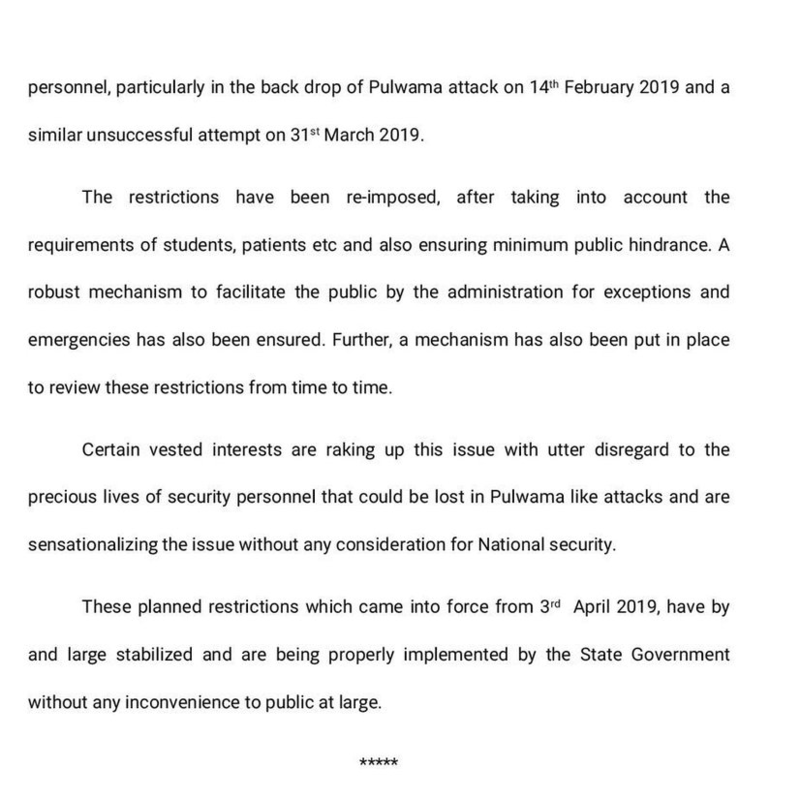 “Certain vested interests are raking up this issue with utter disregard to the precious lives of security personnel that could be lost in Pulwama-like attacks and are sensationalising the issue without any consideration for the national security,” reads the statement. Soon after, Omar Abdullah reacted to the statement with this tweet: This press release sets a new record for the number of untruths told in the same statement. I don’t know where to start with the sheer lies bing told by this unnamed “senior MHA official” except to say there is hardly a word of truth in it.